I was on a flight (not Southwest Airlines) and the flight attendant was acting like she’d been weaned on a pickle. At the first opportunity, I said to her, “I’m so sorry for how you’re being treated by management.” She looked surprised and said, “How did you know?” I could have said, “Because you’re passing it on to ALL of us right now.” I didn’t. She went out of her way to be extra attentive and pleasant after that. So, all your great managers out there, remember to treat your employees today the way you’d want to be treated, no matter what comes up. 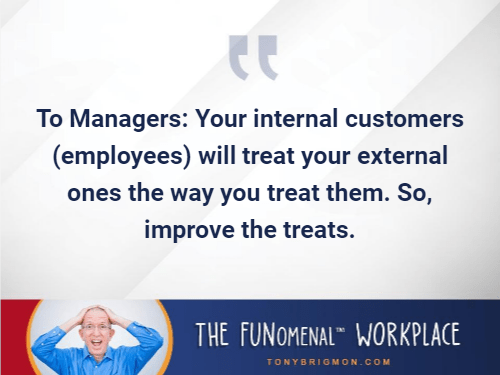 Your *internal customers* will pass that treat on to your *external customers* – to everyone’s delight. How high you bounce after you hit bottom depends on how fast you get off your bottom afterward. Get up. Shake it off. Bounce. No, but he can leap TOY buildings with a running start. FUN is when your brain is a state of *positive*, compared to negative, neutral, or stressed. Even serious people can have fun, get more done, and bring out the best in everyone. Really. Does a frog go barefoot? Yes, indeed. LOTS of clean fun and positive energy to enliven your event, making attendees more receptive to messages presented, and more likely to act on what they hear. So, YNOT book Tony?